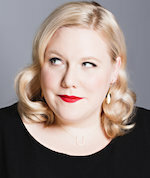 Here's what Lindy West had to say on Facebook about her April 15 show at Benaroya Hall: Huge news! I'm speaking at Benaroya Hall! All by myself! For a long time! WITH A HUMOROUS SLIDESHOW! Frankly, she had us at "I'm speaking"; by the end of that string of phrases, we were ready to see her twice. These are trying times, and they deserve to be skewered, as only Lindy West can. Get tickets here or get more information on our sponsorship page. Many thanks to returning sponsor Northwest Associated Arts for supporting the site and for putting events like this in front of our readers. If you're interested in joining our community of sponsors, check out the last dates available in the first half ot he year. We'd love to meet you.